I am going to another 24 hour horror movie marathon this weekend so I will be even more behind in posts but hopefully next week I can catch up. But onto today’s. Day Fourteen – What is your favorite “drive-in” horror movie? I must admit that I’ve only been to one drive-in in my life and that was this past summer. 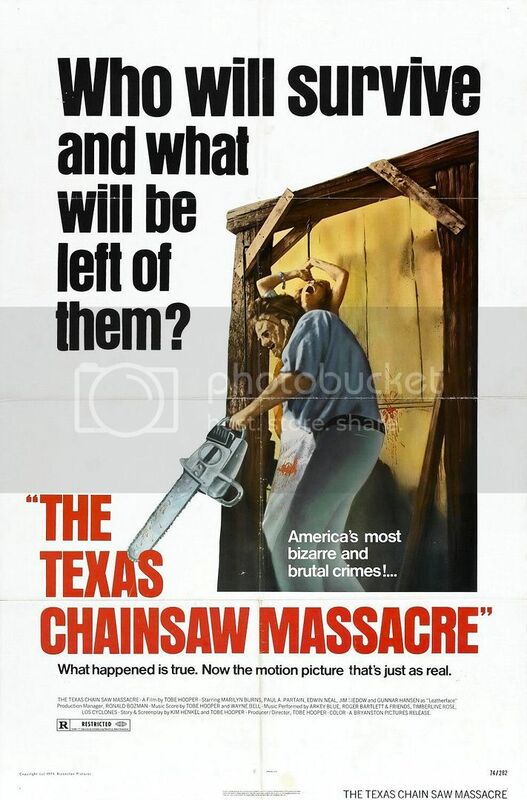 But going off of film history one film that gained notoriety from it’s massive playings at drive-ins (and eventually other theatres) was ‘The Texas Chain Saw Massacre’. I first saw ‘The Texas Chain Saw Massacre’ on video when I was 12 and was completely amazed by the sheer rawness of the film. It was disturbing and shocking and it has this almost realistic feel to it. It took several viewings before I got the dark humor of it but even then it doesn’t take away from the power of the film. The amazing thing about the film is despite its title, and in your face aggressiveness, there is actually almost no gore in the film. Much like Alfred Hitchcock’s ‘Psycho‘ (ironically both films were loosely inspired by real life serial killer Ed Gein) the violence is presented but not actually shown. You see the chainsaw going down but you never see it enter a body or cut off a limb. It’s sheer nature on how it presents the violence lets your own imagination fill in the gory details. I love this film so much because I view it as filmmaking in a raw form. A low budget film shot on 16mm and the use of suggestion and skill it presents a tense and horrifying experience. It’s title may keep it out of the AFI top 100 films but it is a true classic. Even if it does have a character that wears a mask of human flesh.